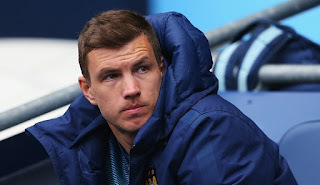 Edin Dzeko will not leave Manchester City, says agent Eden Dzeko will not leave Manchester City for Serie A side Roma this summer, according to his agent. Eden Dzeko will not leave Manchester City for Serie A side Roma this summer, according to his agent Irfan Redzepagic. The Bosnia and Herzegovina striker has been in link with Arsenal and Roma for a summer move but the recent reports have confirmed that the striker is set to stay at Etihad Stadium. Dzeko’s interntional teammate Miralem Pjanic said few days ago that his friend will be joining Roma as City eye their playmaker Adem Ljajic. However, the recent comments from Irfan Redzepagic has claimed that here is no link with the Serie A giants. City do not need money in order to sign new players and Dzeko has no plans to leave despite of a struggling last season at Etihad Stadium. The 29-year-old scored six goals in only 12 starts in Premier League last season. City signed Dzeko from Wolfsburg in 2011. The player has still three year left on his contract. Meanwhile, Arsenal boss Arsene Wenger is also keeping tabs on his situation as he is eyeing to sign a striker this summer. Reports have linked him with Dzeko in the past few weeks. Few weeks ago, it was reported that Arsenal are set to launch a 15 million pounds bid. Read More.